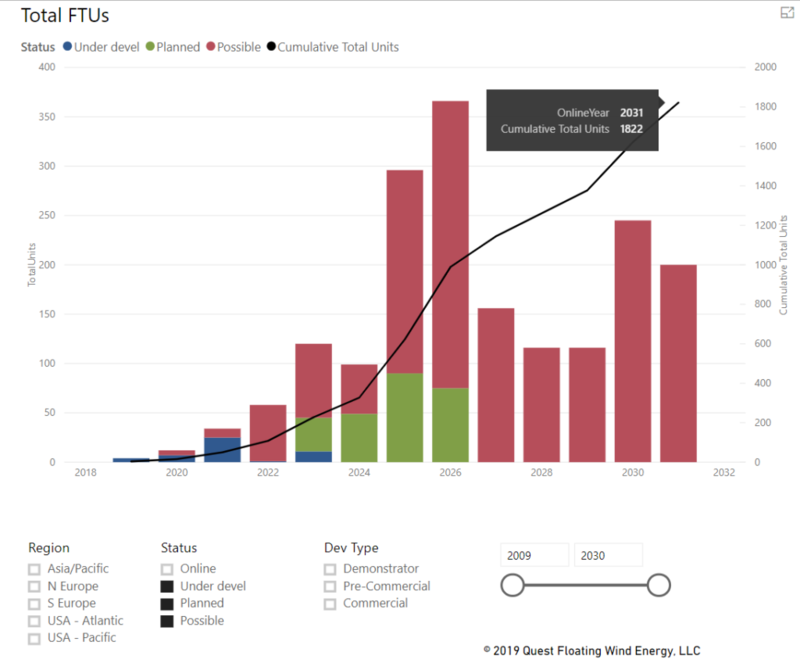 2018 was in many ways pivotal in the development of Floating Wind Energy. The opinion persists that the future of offshore wind will be floating. Increasing stakeholder involvement not in the least by major energy companies joining developers and designers alike on financial investment and technological level will make that happen. The market is moving; trends are becoming visible and tangible: Kincardine saw a shift from 8.4MW turbines to 9.6MW, saving one floater out of six. Castle Wind (fmr Morro Bay) envisions producing 1GW with fewer than 100 Floating Turbine Units. And we see similar plans for the projected Hawaii projects. Further pre-feeds are underway for US projects greater than 2GW and even some 4GW capacity projects. Big numbers. Big numbers in Asia too. Eolfi/Cobra’s multiple 500MW parks offshore Taiwan are waiting for the right sign to start planning. South Korea sees a short term total capacity close to 500MW as well. Then there is Japan where things are finally moving ahead. Hywind Scotland is making performance headlines with greater than anticipated capacity factors in year 1. Principle Power kicked off Windfloat Atlantic, building their learning curve. And Ideol put demonstrators in the water in Europe and Japan where Toda announced a commercial project for their Spar as well. These proven floaters and their designers are an organic selection for first full scale projects. Also ready to prove themselves are Stiesdal’s Tetraspar, Aerodyne’s Nezzy (unconfirmed) and Hexicon. With the French pre-commercials, including the SBM and Naval firsts coming online in 2020, another industry threshold will be passed and planning for their commercial stages can begin. Quadran & EOLFI are already tentatively doing so and set the trend in the shift from designer-driven projects to developer-driven. Trends towards lower cost are continuing. The new Japanese Choshi bottom fixed project has a reported unit cost of €40M and one or two others in Europe too. Floating wind is showing costs by a margin in balance with fixed, and fixed and floating will live and learn next to each other around the 50-60m depth mark. At Q FWE, we maintain our belief that even the US East Coast projects will include some floating wind sooner or later. Trends can break too, but here they create new opportunities. The adjusted tariff policy in Taiwan in response to assumed lower costs for offshore installation changes the project economics drastically. However, other Asian countries might become more attractive for selling Taiwanese power, provided storage and transport become more efficient. If Wind-is-the-New-Oil and will become a traded commodity, will that be a future driver? We think it will. Policies also hinder Europe, where the initial bold French approach towards float is not reflected in the country’s new targets. Same for Scotland where new policy has stopped some projects in their tracks. But that is offset by Spain which will see 300MW afloat by 2022-23 and several demonstrators with it. Floating Wind Energy is alive and kicking. True, some projects have not made it, each for its own reason, but the project pipeline is huge. Over 10 billion USD in projects under development and planned by 2030 (see chart below) and 5 times that much if we include the possible* projects. In number of FTUs installed, that corresponds to more than 300 units under development and planned, and over 1,800 if we include possibles* on top of that. These figures out to 2031 are a summation of known projects today. We expect the numbers to grow substantially as new projects are initiated in the latter half of the 2020s. It is these big numbers and promise that will trigger the supply chain companies to research solutions to decrease lead times and improve projects’ bankability. That is exactly how the O&G offshore construction industry came to prominence in the 1970s-2000s. This time around it will not take that long. (*) Possible is a Q FWE status for a project that is too undefined, with limited and unconfirmed data, low viability and probability indicator values.